4 of us + 1 pooch had the loveliest weekend in the Nook, the cottage itself is a lot bigger than we expected & the welcome gifts the owners left were very thoughtful! Loads of lovely walks close to the cottage and great base to explore! We will definitely stay again - thanks for a fantastic weekend. Such a beautiful cottage, had the most amazing time. Superbly dog friendly yet you wouldn’t have guessed a dog had even been there. Just mind your head between the kitchen and dining room. It took 10 bashes on hubby’s head before he learned to duck! Very accessible for the lakes and sea. Superb dog walks. We will definitely be back. Such a lovely setting, ideally located, quiet, extremely clean and well presented, like a home away from home and some lovely touches from the owners to make you feel welcome throughout. Highly recommended, we will return again. A beautifully presented cottage, lots of lovely touches including fresh flowers in every room and a hamper. Very difficult to fault. Lots of places to visit with an hour away. The Nook was certainly the place to relax & recharge after a busy few weeks. Booking was simple, the accommodation is ample for 4 people & one dog, if anything the photos do not do the space justice as it was definitely larger than we anticipated. Great for exploring the local area. Managed to explore a couple of walks in Arkholme, which is a lovely village with very friendly locals. The Sun In at Kirkby Lonsdale provided us with an excellent evening meal. Emily and Ben were delightful, generous hosts and we were thrilled to receive the 'welcome hamper' containing essentials and locally produced goodies. All in all - a delightful, comfortable cottage - we hope to return in the Spring. We had a fantastic week staying at The Nook. Excellent hosts , lovely hamper and flowers in every room. We couldn’t have asked for more. Looking forward to returning. 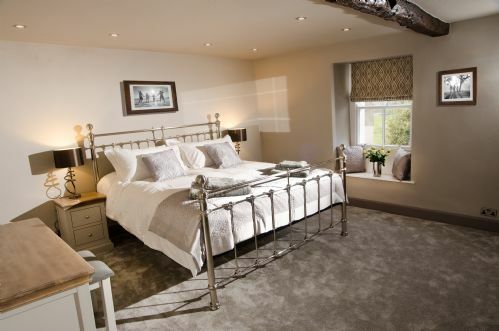 Luxury accommodation situated in a tiny village outside the market town of Kirkby Lonsdale which has been beautifully restored and tastefully decorated. We had a lovely relaxing time here, as every amenity is provided and thoughtful touches such as fresh flowers and home baked treats. All fixtures and fittings are top notch and it feels like every attention to detail has been considered. We would very much like to return here. The nook is a superb accomodation. Everything is wonderful and it’a excellent value for money. We hope to return! You want to explore the Lake District or enjoy a refreshing holiday in peaceful surroundings: "The Nook" is the perfect place for both: a very comfortable, well equipped and cosy cottage with a wonderful garden that we can fully recommend! We would love to come back! This is a fabulous cottage in a lovely quiet location with a great garden overlooking rolling fields to the rear. The Nook has recently been renovated to a very high standard and Emma and Ben have put a lot of careful thought into the interior designs, furnishings and fittings. Fabulous fitted kitchen with everything you would need and more and fantastic bathrooms, I want them in my house! The bedrooms were of a great size and the beds and bedding were better than 5 star hotels. Lounge was perfect for chilling and enjoying a little TV time, just perfect. I bet in winter it is so cosy and warm, in fac5, we will be back to try it out. Lovely Area for walks with easy access to Kirby Lonsdale, the Lakes and Yorkshire dales. Emma and Ben could not have done any more for us, as hosts they are perfect. Flowers in all Rooms, welcome hamper with lots of lovely goodies, w8ne and home made cake and cookies. Thanks Emma, Ben and family from Jackie, Andy and Molly the little dog. Beautiful cottage in a beautiful setting. Would highly recommend. Perfect location to explore area. This is a stunning cottage with a beautiful garden. Would highly recommend. Good location to explore local areas. What an amazing job Ben and Emily have done with this place. The cottage is beautifully furnished and set in a lovely village. We loved sitting outside in the morning having breakfast and listening to the lambs at the bottom of the garden. The Nook is well equipped and the other little touches like the welcome treats make this place feel truly 5 star! Can't wait to go back. I booked this cottage for the Easter weekend for my parents, myself and my dog Trudy. The cottage is in a lovely quiet village/town very near to Kirby Lonsdale which is wonderful town with lots of nice shops and restaurants (many of which are dog friendly). We really enjoyed walks in the nearby area and then drove to the Lake District on a couple of the days we were there for some different scenary. The cottage itself is absolutely beautiful, really well furnished, lovely big bedrooms (with very comfy beds), very large modern bathrooms and a modern kitchen. The living area is also large and very homely as there is a wood-burner. My personal favourite feature of the property is the garden because it is very pleasant and picturesque. The property was very well stocked of anything you might need in the kitchen and there are lots of maps/books for walk suggestions etc. It was the first time my parents stayed in a rental cottage (they prefer staying in hotels or B&Bs) but they had a wonderful time and said they would love to go back! Thanks for the lovely time!